Notes: New Softcover printing Feb 2016, collects the original three issues by Olympian Publishing in 2008-2009. First collected edition released in hardcover 2012. 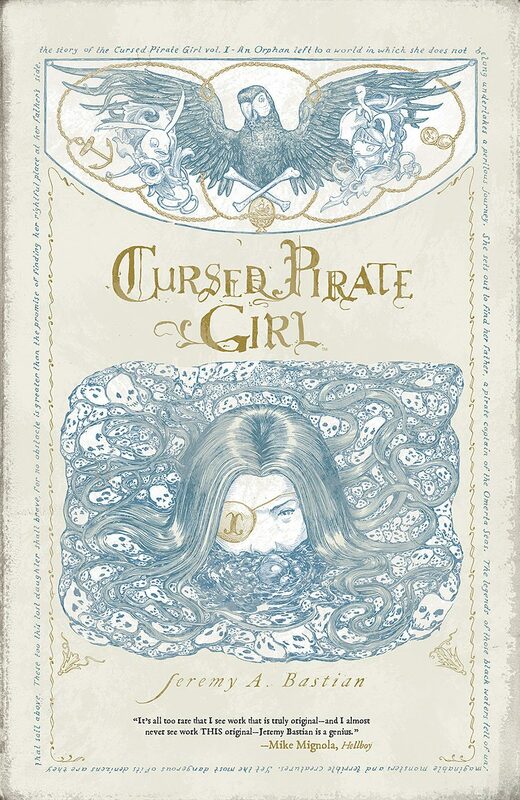 Cursed Pirate Girl is a definite treasure one could find at your comic store or retail comics hub, and for keeps on any bookshelf. It’s a book for almost anyone of any age (9 and up suggested) who loves good adventure in graphic storytelling, with danger above the G rated level. Much of it feels carefree and fun, yet maintains balance in dramatism, intrigue. The premise is simple, as we get to know our young female pirate protagonist and the olden century style world she daring dwells in; everything else is not. 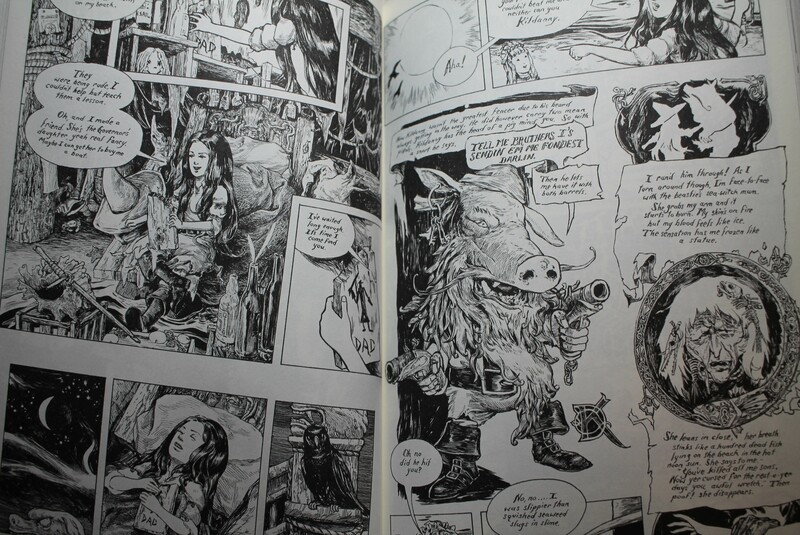 Foremost noticed when opening the book, is the amazing black and white artwork and stylish layouts. There is a distinct style of Jeremy Bastian’s art that draws from the best of the late 19th century comics detail combined with creative panel structures and skillful transitions. Supporting characters and villains are very distinct and memorable in their parts to the overall story, as their appearance commands instant familiarity and exposition. The overall environment and situations are exquisitely detailed, for which for being black and white feels as rich a colorful Disney classic. Here is a sample..
For a mere three chapters and an epilogue, the book gives the readers plenty to amuse on for the story as well as the art. The main character is fantastic as the protagonist as she lives her own best fantasy. She is the Cursed Pirate Girl, in search of her father whose deep motivation in pirating comes from his apparent spirit, though there is more to that. The world around her is dangerous yet beautiful, especially when delving into the mysterious depths of her adventure. There are personal conflicts and external happenings that coincide, where her lifestyle is the best entertainment for those seeking high seas excitement. You’ll find fantastic villains and interesting companions, who border upon the stereotypical roles (parrots, aristocrats, monstrous fathoms, pirates) yet give off more in detail elements and elaborate story exposition. There is much else to love about the book, especially the freeform lettering that is as playful as the story itself. Many of the panels pack with astounding details in historical architectural and nautical visuals details. Overall, the presentation does not make for a quick read as the readers must take time to admire the details to fully appreciate. The result is a cool fairy tale with little to bear on actual pirate history, as the lifestyle aspects draw from the fantastical glamorous interpretations ranging from Captain Singleton to Captain Jack Sparrow. 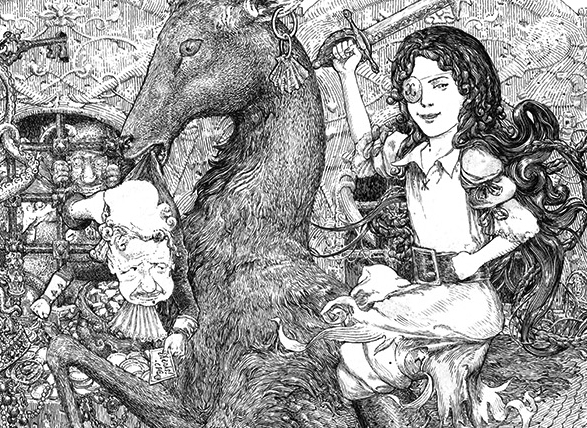 Jeremy Bastian then adds much of his own imaginative spin, probably influenced from his own travels and literary tastes. The new softcover edition s the latest release, reprinting the original three issues and much more. The binding is a sturdier than normal glossy shell, with the higher quality one finds from the Archaia brand of deluxe volumes and graphic novels. The price is a worthwhile $19.99, a grand deal for the treasure within. – Orion T, captain of the Stranger Worlds exploratory vessel and comic book/storytelling enthusiast. Loved a good comic book read to go with his milk and cookies.